As more community banks and credit unions begin to embrace social media, it is important for them to determine who exactly will be the voice of their brand? Typically this task is left to a role known as the social media community manager. This could be your entire consumer base, a segment of consumers, or prospects. For Social Media, it’s useful to think of audiences on each channel (Facebook, Twitter, etc.) as their own community. A social media community manager is responsible for the growth and maintenance of that community. Their purpose is to ensure that every member has a sense of belonging and ownership and that the community creates value for its members. Why is a community manager important for community financial institutions? The funny thing about communities is that they will form with or without you. By being active in the process you have the opportunity to put the community to work for your institution. It's the chance to build advocates. Focus groups are expensive, but investing in growing a community gives you a constant stream of consumer insights that you can tap at any time. Conveniently, it also ensures that you have a primed audience to market to when the time comes. Research suggests that consumers struggle with seeing points of differentiation when comparison shopping financial institutions. Humanizing your brand within your community is a powerful way to cut through the marketing noise and connect with consumers. It’s a competitive edge that larger institutions cannot authentically replicate. What skills do social media community managers need? What goals should a community manager be measured against? Are there KPIs connected with those goals? The goals of a social media community manager will change depending on the current business objectives. However, there are some KPIs that a community manager should always be benchmarking and reporting on to monitor the health of the community. Through these benchmarks, you can better understand how the community reacts to certain campaigns. Growth Rate = Number of new fans / Fan count at the start of the time period. Engagement Rate = Total number of actions (likes, comments, shares, clicks) / Audience size. This number should tell you how well your content is resonating with your audience. SOV (share of voice) = Number of your brand mentions / Your mentions + All competitor mentions. This number gives you an understanding of your digital conversation share. If a competitor has more (or a growing) share of voice, you can look at their profiles to try and reverse engineer their strategy or find gaps in their content. Sentiment Score = Positive mentions / Total mentions. This is an important companion metric to SOV. Not all mentions are good mentions. You might be losing SOV, but if that is due to a recent scandal at a competing institution, then it might not be a bad thing. Referral Traffic – There is no calculation for this metric, but tools like Google Analytics will be very helping in reporting. Many campaigns have a goal of opening accounts or loans through the website. Seeing how effectively your content (and specifically which pieces) are driving traffic to your site will be an important metric to track. Community Demographic Data - Who is this audience made up of? Where are they? What devices do they use? What assumptions can we make about their needs based on their gender, age, etc.? Top influencers - Who are the community rockstars? What relationships can we leverage for future marketing campaigns? Competition Data - How do we compare to other community bank and credit unions in the area? What can we learn from their strategy? What gaps in their strategy can we capitalize on? Should community management be one person’s job? The short answer is; it depends. 1) How big is the audience of these social media communities? 2) Do we have strong brand guidelines in place to manage our voice? 3) What departments could benefit from being closer to our consumers by contributing to our content strategy? As a general rule, social media performs better when it is part of the organization’s culture. That said, there should always be one person ultimately accountable for everything that goes out onto your organization's social media page. They should have the freedom and authority to approve or push back on content and conversations. How do you handle negative comments or community managers? We all have that fear of going viral for the wrong reasons. It’s that momentary panic you feel before you hit the “send” button on an important email. That’s a fear many of us share in regards to building a community – what happens if we start getting negative comments? 81% of 25-34 have complained about a brand through social media. So, the reality is that people will complain about you whether you’re on social or not – the only real question is do you want to be a part of that conversation? Being active affords you the opportunity to correct any mistake, learn from it, and potentially salvage the relationship. In fact, this can be a great tactic to build your most loyal and vocal brand advocates. What should social media community managers know about compliance? Compliance is listed by community financial institutions as the number one reason for staying off of social media. Before getting social, the social media community manager and compliance team should sit down and agree on a social media policy. Having these guidelines in place will free the community manager to take advantage of real-time opportunities knowing that the compliance department supports them. How can a community manager help foster user-generated content (UGC)? How old were you when you learned to drive? Did you first car have a name? In which state did you learn to drive? Post a photo of your dream car. One your audience has become accustomed to interacting with your brand, you can move to questions that require a little more effort or are more self-serving for your institution. What is the biggest mistake you see community managers make? 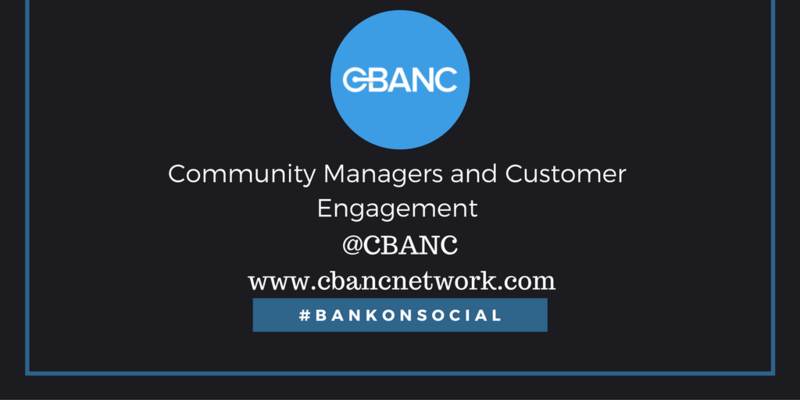 The most common mistake community financial institutions make is not having a community manager. Their communication strategy is too one-directional. To be successful on social media (and in community management) you must be truly social. That means putting your promotional message aside and investing in your community. Next How Do People Shop For Houses?